You can read the full turn 3 recap here. You can see all of the campaign posts so far by clicking on this link. 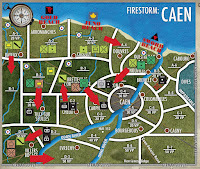 You can also follow the campaign using the hashtag #firestormcaen on twitter. Campaign progress so far. Blue is Allies. Red is German controlled. I've included a few non-official missions in this turn. The missions, as always, are just a recommendation. 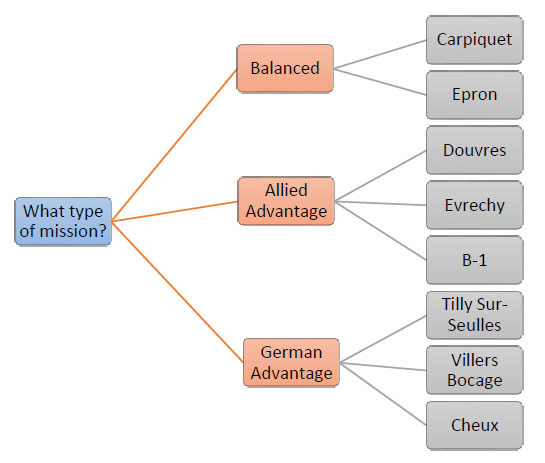 If you are your opponent would prefer then you are welcome to use the standard mission listed. This turn has some unbalanced firestorm troops in some of the scenarios. The German forces now have to remove Firestorm troops as their reserves are being fully committed to battle. The Allied troops are desperately attacking to capture ground around Caen and have exposed themselves to counterattacks from the Germans. If you play with unbalanced forces or non-official missions, please talk with your opponent to ensure that both parties are open to a narrative game where the forces are not perfectly equal. Personally, I would recommend it as it adds great flavor to your campaign game and introduces new challenges. Scott and Alex's night fight from Turn 3. Despite weeks of fighting, the Allied landing at Sword Beach has still not been secured. Fierce counterattacks by the 21st Panzer Division and the elite 2 Panzer Division have destroyed many of the troops at Sword Beach. Allied forces at Juno Beach have launched an assault on Douvres to consolidate the landings around Sword Beach. 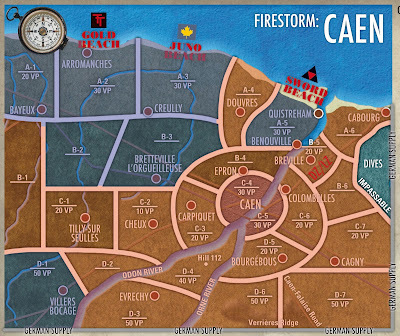 After the unsuccessful assault on Epron at the start of Operation Epsom, Allied high command has declared that the town must be taken at all costs. German forces have been entrenched in the city since D-Day. 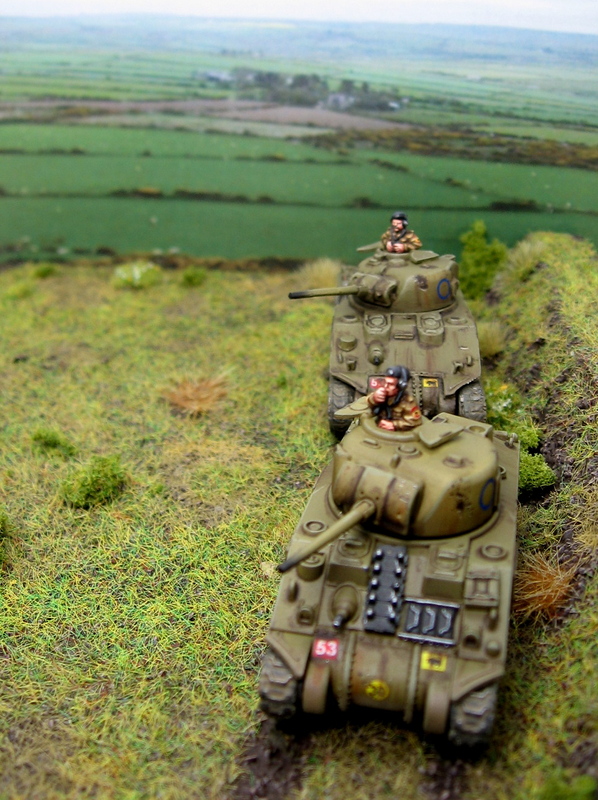 Allied forces have an uphill battle to try to capture this battered ground. Operation Epsom saw the Allied troops successfully advance in the center of the British sector of the front. 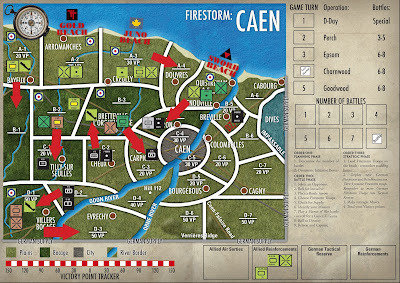 Despite heavy losses, Allied high command has ordered the British and Canadian troops in the area to continue the advance in the desperate hope of surrounding Caen before more German troops can reinforce it. 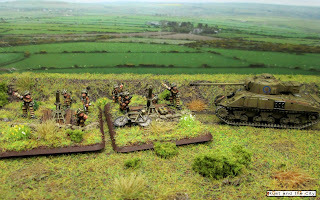 Allied morale is low as troops have struggled with the dense bocage hedgerows that embody the battles of Normandy. 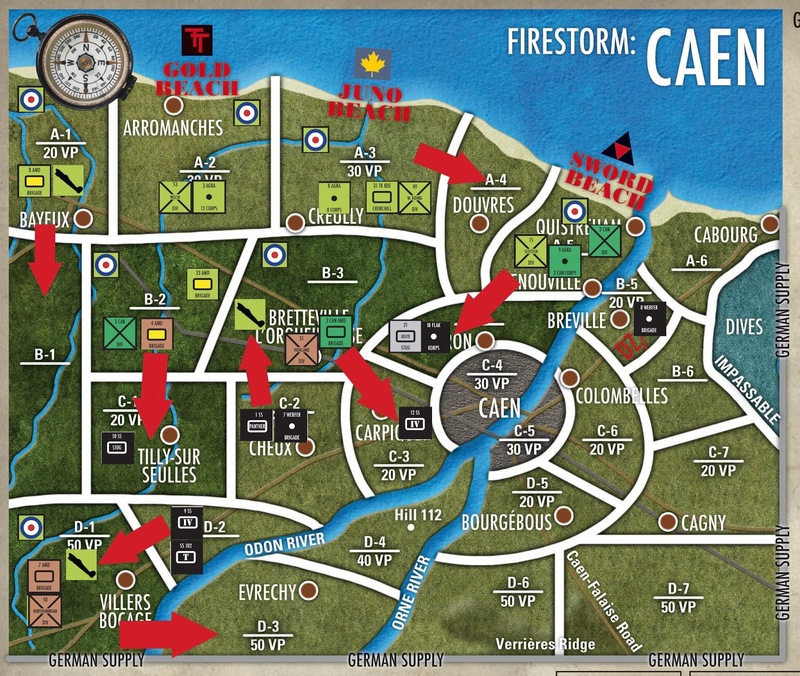 Finally, here at Carpiquet, the Allies can bring their speed and numbers to bear as they break out into the plains. Mission: Seize the flank (IF Tank or Mech only, download here). Hold the Line if either company is infantry. 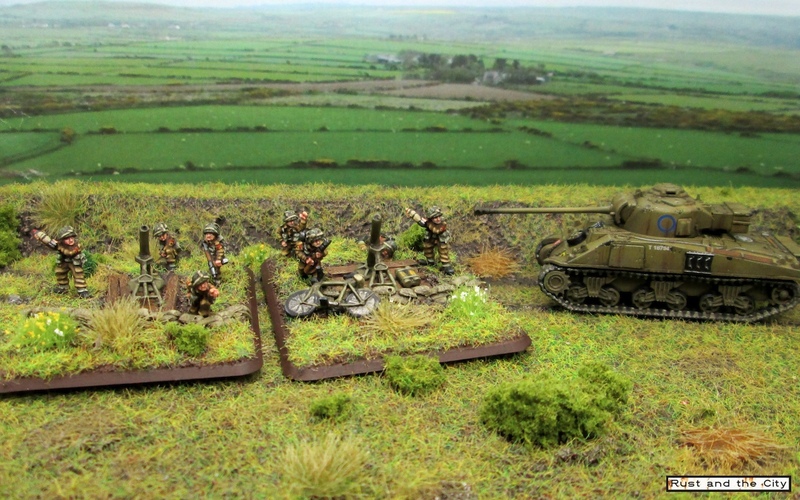 Allied troops look to break out of the bocage with a victory at Tilly Sur-Seulles. This battle is crucial as the Allied forces at Villers-Bocage are surrounded and out of supply. Winning this battle offers the chance to encircle and destroy the German troops on the Southern Flank at B-1. 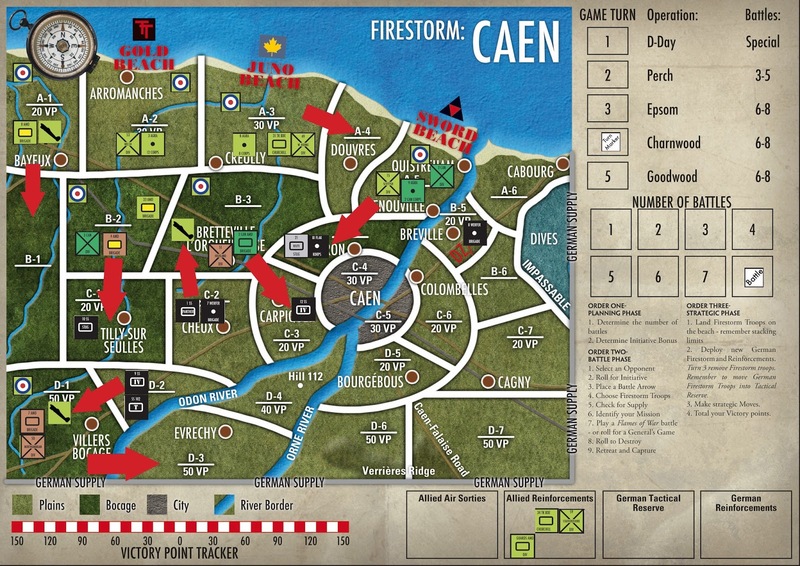 While not threatening Caen, this battle is essential to protect the fragile and overstretched troops in Villers-Bocage. Now that pesky Tank Ace, Michael Wittman, and his Tigers have been chased from Normandy, the Allied forces are free to advance on Evrechy. The Allied forces are dangerously overstretched and out of supply. Their morale is low due to the lack of supplies. They need to capture Evrechy to gain control of the fuel and supplies stored in the town as well as threatening the rear of the Axis forces around Caen. SPECIAL: Allied forces at this location are Out of Supply. They are all 1 motivation level lower than normal. Ex. confident troops are now reluctant. Reluctant troop morale is on a 6+. Fearless troops are now confident for this battle. Calculate points as normal, and then play with your troops at 1 lower motivation level. This applies to Firestorm troops and your normal company troops. As the Allied troops at Villers Bocage press on into Evrechy, the 8th Armoured Brigade at Bayeux has launched an attack on the German troops in B-1 to recapture the lost ground and support the tired troops. The German troops in the region are depleted after the withdrawal of the Panzer Lehr division from the area. The area is lightly defended by only the remaining stragglers defending the rear while the Allied forces are support by an air strike from the formidable RAF Typhoons. German troops must defend the territory to slow down the Allied forces while their own troops avoid encirclement and destruction. Despite the loss of the 101st Schwere Panzer Division, German forces are stubbornly launching another counterattack into Villers Bocage. 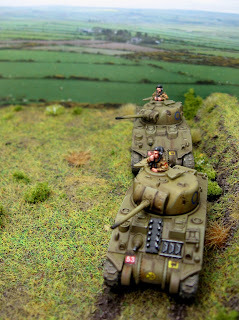 With the tired 7th Armoured Division overextending itself on the attack, the vital town is left frightfully unprepared for the attack. Only an air strike by the RAF Typhoons can help the tired and demoralized troops defending the village. Seeing the Allies overextending with their attack into Capriquet, German commanders are launching a daring attack into Bretteville L'Orgueilleuse to recapture the ground lost during Operation Epsom and stall the Allied attack. The German forces have committed their strongest reserves in this attack to cut off the Allied forces. There are some unbalanced Firestorm Troop match-ups this turn. Make sure you and your opponent agree on the game to be played. I made a handy chart to help you to pick your game. Remember to send your results in the following format to rustandthecity at gmail.com. Turn 4 results should be submitted by January 11, 2015. Fancy maps! I like them. Some of my poorly written orders appears to have sent my troops in unintended directions but that's the friction of war I guess. Ahhhh, I found the error in our facebook message. 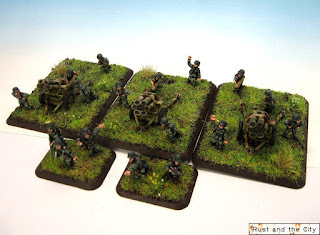 Some confusion with the 7 werfer and 9 SS. They got sent to two locations! Sadly our group here in Texas wasn't able to get our games in this turn. Our respective forces have been pulled off the line to rest/refit, in preparation for the final push in Turn 5! There's lots of battles to go around for Turn 5! I cannot read beyond the preview. I click "Read more>>" and nothing happens.